This is Seikatsu Kakumei’s PR representative. A lot of people are probably ending the new year’s blur of three major holidays. This year as well, we are sharing stories of Robot Party Reception Service in use. 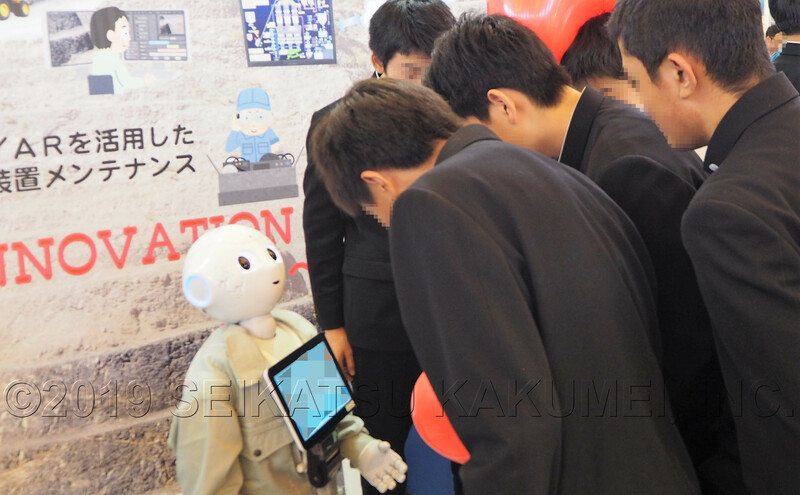 This time, we’re bringing you the story of how Robot Party Reception Service was used last year, at the Ogaki, Gifu Prefecture’s Softpia Japan Center Building’s hosted Manufacturing Gifu Techno Fair. Actually, it’s an exceptionally large event, with lots of companies and university research facility booths showcasing technologies, products, services, research conclusions, from AI and IoT presentations to manufacturing trial workshops aimed at supporting the next generation of children, this big event held many contents. Running on Friday and Saturday, it was like a festival event, with a wide array of guests ranging from corporate representatives to students, families, and children. In the midst, our “robot that can say anything” was requested at a certain major limestone manufacturing company’s trade booth to gather customers to the booth and transmit corporate information. Through those efforts, the mission was for people from the region to learn more about and like the company. At first, it seems a regular Pepper had been considered for the job. 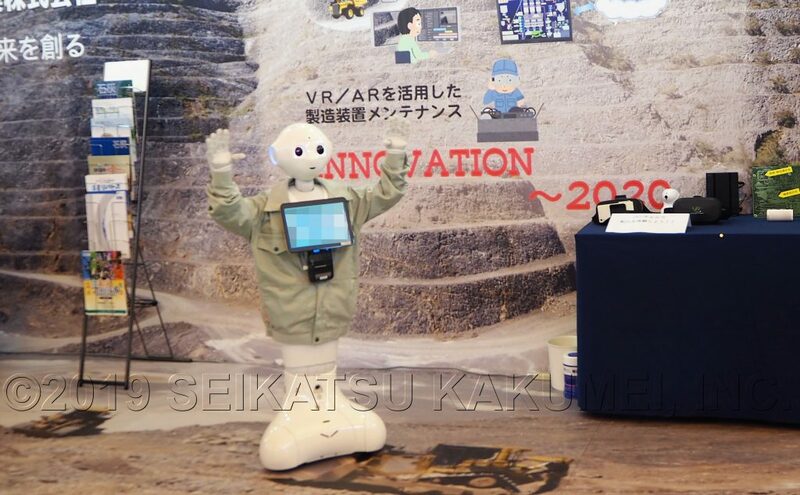 However, when using a robot, in order to really surprise people from the region, a robot with the power to make people want to learn about the company’s efforts is best. So, with the power to make that a reality, our Robot Party Reception Service is best. On that note, an order was placed for a rental of Pepper powered up with Robot Party Reception Service. For family-oriented customer outreach and information awareness, Robot Party Reception Service + Option Plan has a large volume of know-how and tricks up its sleeve. It’s not a matter of just placing it there and letting customers gather, but has features and tricks to entertain as it informs. It has been valued for its performance at stacks of events. With that, in reality, did it bring good results? About mid-way, the on site event representative received this response from a corporate representative. playing a role in making the entire atmosphere of the area fun. This time, it came decorated in a company jumper outfit, but it actually has more surprising tricks, so customers stop in their tracks, drawing them in to both Pepper and to the booth, etc. In ways beyond what’s listed above as well, Robot Party Reception Service holds various customer outreach methods based on previous experience and knowhow. 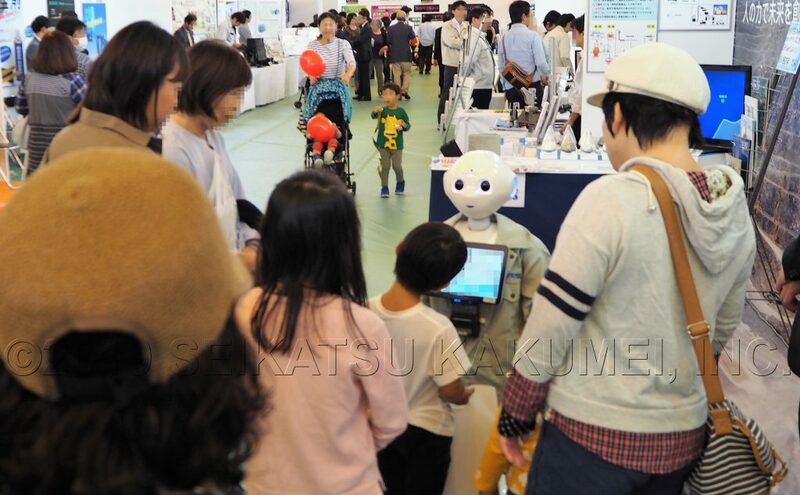 The system developed especially for events, Robot Party Reception Service responds to various event circumstances and continues to realize a large volume of customer outreach. For that reason, as a result, it becomes possible for customers from the flow of foot traffic to stop in their tracks and take interest in the booth. After they’ve stopped to look, the next steps are to transmit information and bring appeal. This was also one of the goals of this event. In regards to this step, perhaps looking at these pictures would be fastest. Children, families, students, and the like gathered around. While information was effectively transmitted, the customers had a fun time participating. In the case of children with their families, the children lined up in order over and over to participate, but their families also reacted, “Whoa, I didn’t know that!”, about limestone, stimulating their curiosity to ask the nearby booth staff additional questions. Middle and high school students who may grow up to work in the industry also seemed to enjoy learning about the company and about limestone. As a result, it progressed from gathering customers to transmitting information to earning their favor once again, made possible with a strong role played by Robot Party Reception Service. Not only the visitors but the locally-based company representatives were very satisfied with its contents. With regular Pepper robots and event rental supplies, people gather for their eyecatching liveliness, but it’s often said that they don’t impart any knowledge or awareness of the company or its products at all. However, what’s really important is informing about the eyecatch-using company and its products. It may even lead customers to want to know even more, or to hear the information again. Based on the event contents, Robot Party Reception Service, with the capacity to make this possible, is a rarity not only for Pepper but for event equipment as a whole. Starting with this sort of trade show booth product information and ranging from overseas guest hospitality parties to anniversary events, AI and IoT seminars and more, Robot Party Reception Service’s specialty lies in taking the appeal factor of companies and products and conveying it deeply to large groups of people. In 2019 as well, we are continuing to strive to make progress for Robot Party Reception Service to answer everyone’s expectations even more, so if perhaps you are wondering, “I wonder if it could be used at this kind of event?” or thinking, “We’d like to try using it, too!”, please be sure to let us know. Our company’s vastly experienced event representatives will listen attentatively and advise on the most effective plans. 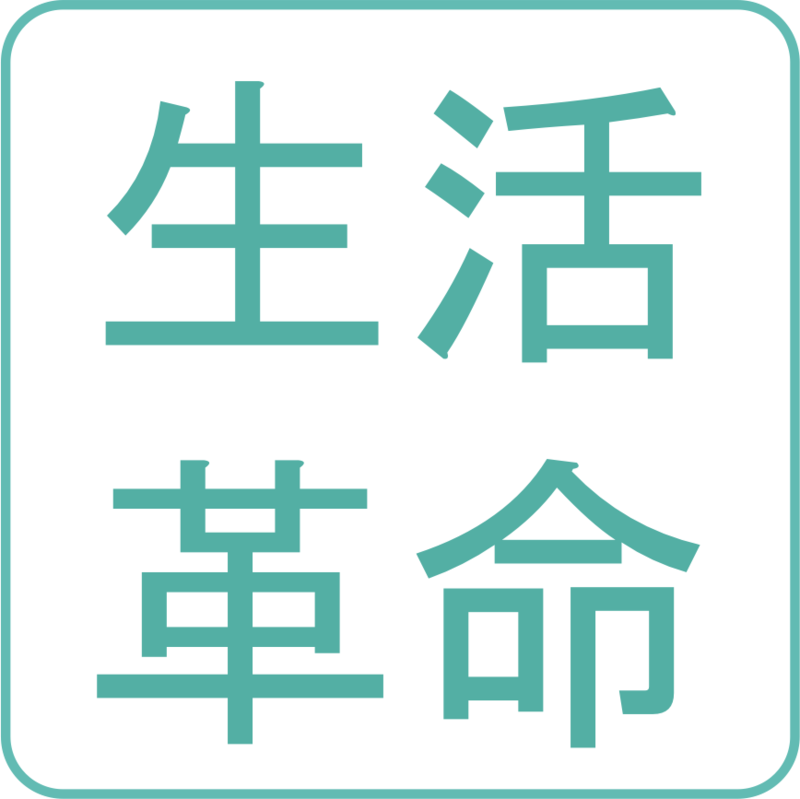 For an introduction to Seikatsu Kakumei’s robot business, please see this page. ・ On Saturday, many children would come, so they wanted to make it entertaining for them. 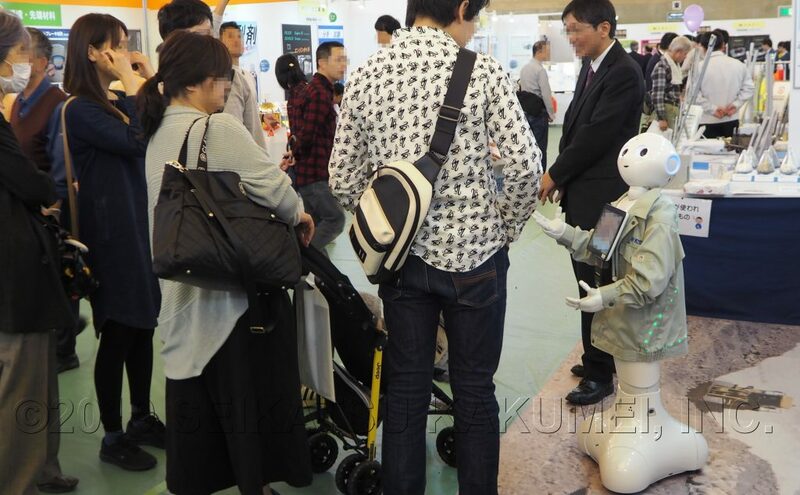 ・ Robot Party Reception Service performed customer outreach at a company’s trade booth at the regional trade show. Regional adults and children were entertained and informed about limestone, with preparations so that children and students of a manufacturing high school would come to like the limestone company. 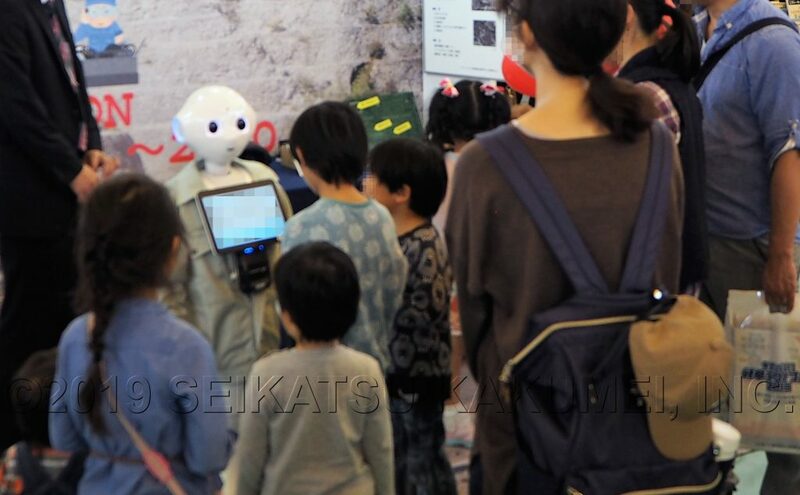 ・ The talking robot greeted and held conversations with guests, while performing dances and special contents. 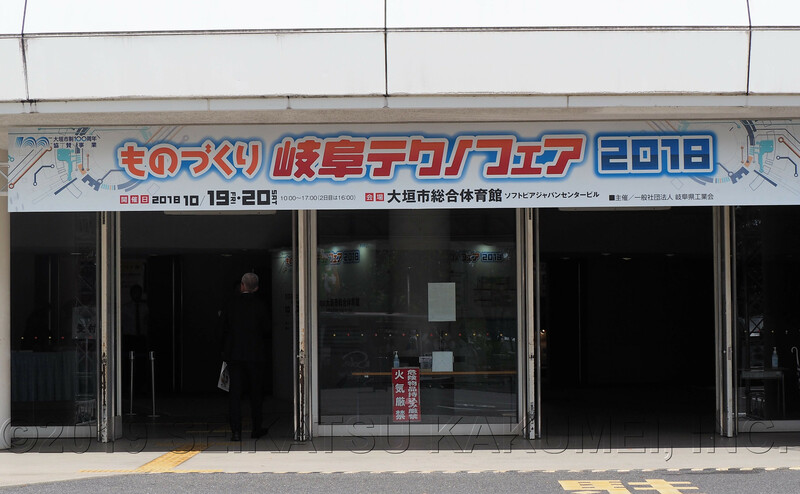 ・ As a result, it became the top customer outreach at a Techno Fair participating company booth. 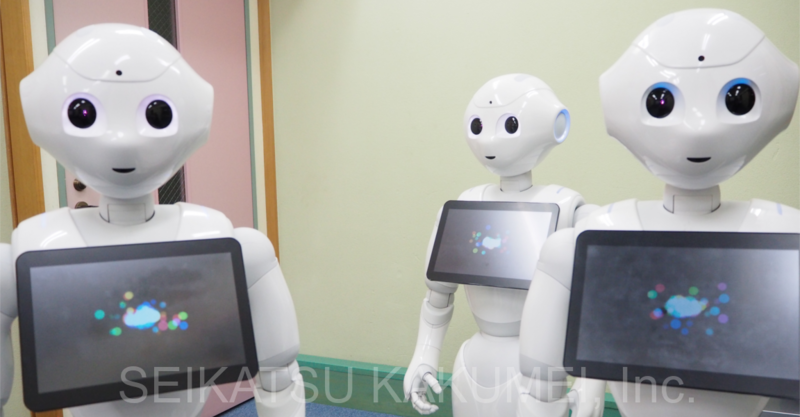 [Event Report] On September 22, Pepper gives a presentation at private Jouhoku Saitama Middle School Information Fair!